Saudi Arabia is a vast country and a diverse land. You can find all sorts of breath taking natural destinations in there, from great mountains to golden beaches to massive deserts, and all are globally renowned and well-maintained. And natural reserves in Saudi Arabia are just as varied and spectacular. The government in Saudi Arabia is keen on preserving the natural reserves and protected areas in the kingdom, and on breeding and reintroducing endangered species. Many of which are home to endemic plants and nearly extinguished animals; let’s take a look at the most gorgeous natural reserves in Saudi Arabia. In 1991, the Arabian Gulf was hit by a catastrophic oil spill. As a result, the plant and animal life was severely affected in the area. Some forms of life were extinguished altogether. 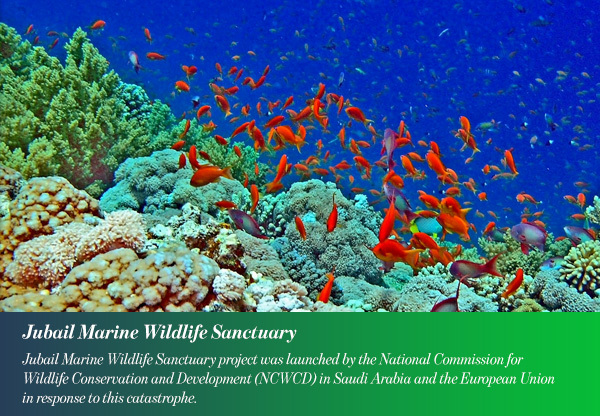 “Establishment of a Marine Habitat and Wildlife Sanctuary for the Gulf Region” or Jubail Marine Wildlife Sanctuary project was launched by the National Commission for Wildlife Conservation and Development (NCWCD) in Saudi Arabia and the European Union in response to this catastrophe. The project includes a Wildlife Rescue Center which was used for the treatment of 1500 oiled birds and other forms of affected wildlife, a field research station with wet and dry laboratories, offices, stores and a Visitors’ Room. The Sanctuary area encompasses specimen of all major habitat types of the western Gulf. 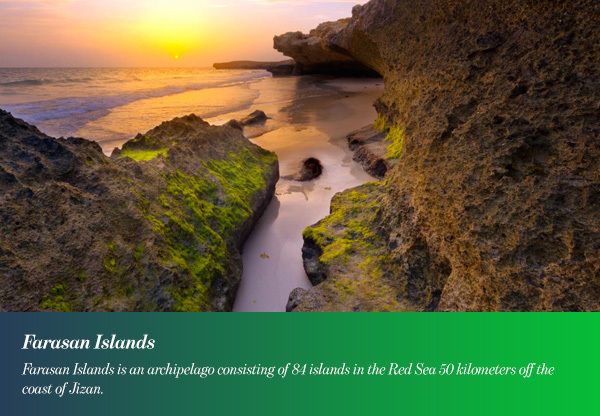 It houses diverse coral reefs, provides a nesting space for marine turtles and also provides a natural habitat for several species of seabirds. Al Harrah is a large basaltic volcanic field near the northwestern borders of Saudi Arabia. The area includes vast lava fields and gravel plains as it is essentially a volcanic area. 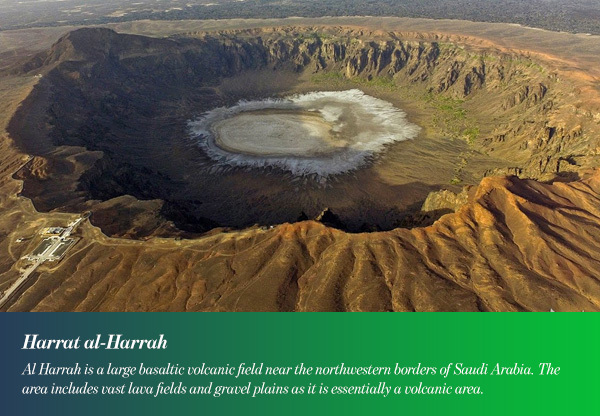 In 1986, the 12,150 Square kilometers Harrat al-Harrah became a Protected Area in northern Saudi Arabia. A total of 22 species of mammals live within the reserve’s boundaries, in addition to eight species of native carnivores, the Arabian Wolf Canis lupus, the Striped Hyena and the Caracal. The protected area is also home to the Endangered Arabian and Sand Gazelles and offers wintering and breeding grounds for the Golden Eagle, and a wide variety of other birdlife including nine species of larks. 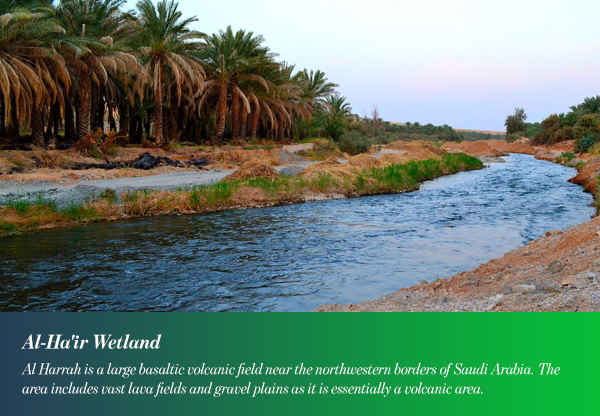 Wadi Hanifah is a natural watercourse and wetland with flows supplemented by groundwater. It is one of the most gorgeous natural reserves in Saudi Arabia. The flows from the Wadi Hanifah enter the Lakes at the upstream end, then pass through the lakes and leave at the downstream end. The area was subject to a restoration and enhancement program. The Al Ha’ir Lakes, located to the south of Riyadh, cover a combined area of approximately 35 hectares. Farasan Islands is an archipelago consisting of 84 islands in the Red Sea 50 kilometers off the coast of Jizan. The main island is Farasan, it is the largest island in the group and it serves as a tourist destination complete with great facilities. While the uninhabited islands serve as breeding sites for a diverse number of birds. They are also one of the most important natural reserves in Saudi Arabia for Arabian gazelles. Moreover, Farasan’s spectacular coral reefs and amazing marine richness offer some of the most renowned diving sites in Saudi Arabia. 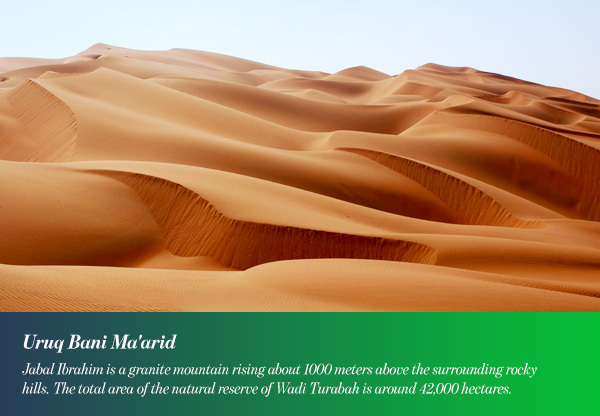 One of the major natural reserves in Saudi Arabia, and also one of the most beautiful, The Wadi Turabah Nature Reserve is a protected area near Makkah in southwestern Saudi Arabia. The nature reserve adjoins the Jabal Ibrahim/Wadi Buwwah Protected Area. Jabal Ibrahim is a granite mountain rising about 1000 meters above the surrounding rocky hills. 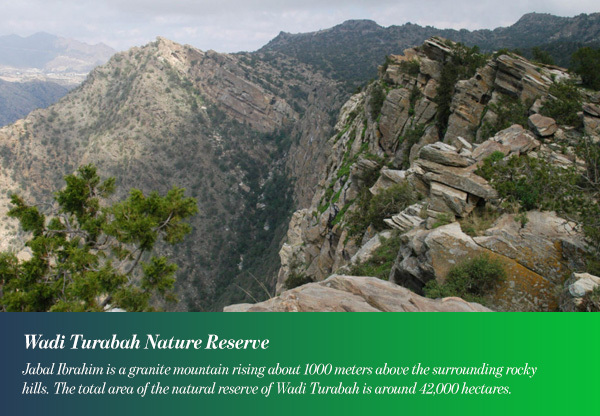 The total area of the natural reserve of Wadi Turabah is around 42,000 hectares. Several interesting animals can be found in the reserve such as The hamadryas baboon, the Arabian wolf, the red fox and the caracal. Furthermore, endemic fish such as Cyprinion mahalensis, Garra buettikeri and Barbus apoensis are found in the streams. The flora in the reserve, specifically in Jabal Ibrahim, is of high botanic interest as well. Uruq Bani Ma’arid is a natural reserve situated in the western edge of Rub’ al Khali which is the largest sandy desert in the world, southern Saudi Arabia.The site of this protected area extends over a total area of 12,658 square kilometers. The natural reserve has been chosen for the reintroduction of animals that historically inhabited the area before some of them became extinct in the wild. These animals have been bred in a captive program before they were released into the reserve and monitored. The animals include the Arabian oryx, the Arabian sand gazelle, mountain gazelle and ostrich. In addition to that, ‘Uruq Bani Ma’arid has been designated an Important Plant Area. That is due to the abundance of its plant life in comparison with the rest of the Empty Quarter, as well as the presence of many endemic plant species. The Gulf of Salwah is the southern section of the Gulf of Bahrain. It is a narrow bay separating Qatar from Saudi Arabia. West of the bay is a well-vegetated shore while the east comprises low cliffs and hills, with sand dunes and salt flats at the southern end. 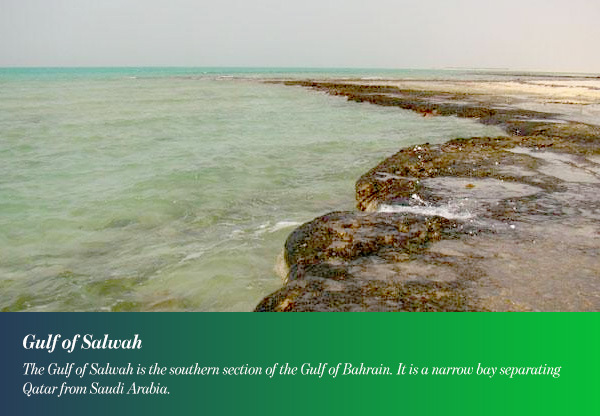 The western coast of the gulf is a natural reserve known as the Gulf of Salwah Protected Area. It is designated as an Important Bird and Biodiversity Area. The protected area is the main breeding ground of the Socotra cormorant in Saudi Arabia. One of the few places where the Arabian oryx has been reintroduced, Mahazat as-Sayd Protected Area is a 2190 square kilometer protected area in central Saudi Arabia. The natural reserve is totally closed and fenced. Protection from livestock grazing has allowed native vegetation to flourish. In addition to the Arabian Oryx, the reem gazelle and red-necked ostrich have been reintroduced in the reserve as well.